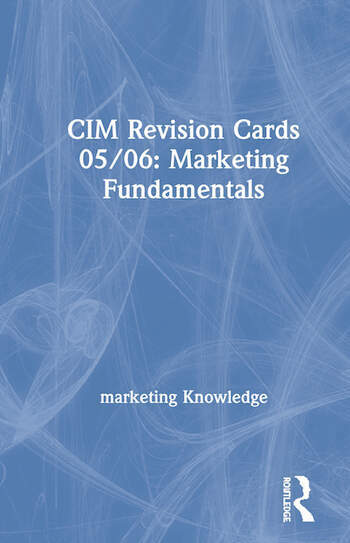 Designed specifically with revision in mind, the CIM Revision Cards provide concise, yet fundamental information to assist students in passing the CIM exams as easily as possible. A clear, carefully structured layout aids the learning process and ensures the key points are covered in a succinct and accessible manner. The compact, spiral bound format enables the cards to be carried around easily, the content therefore always being on hand, making them invaluable resources no matter where you are. Features such as diagrams and bulleted lists are used throughout to ensure the key points are displayed as clearly and concisely as possible. Each section begins with a list of learning outcomes and ends with hints and tips, thereby ensuring the content is broken down into manageable concepts and can be easily addressed and memorised. The development of marketing and marketing orientation; Marketing planning and budgeting; The marketing mix: product; The marketing mix: new product development and portfolio management; The marketing mix: price; The marketing mix: place; The marketing mix: promotion; The marketing mix: service and customer care; Marketing in context.